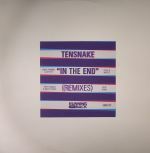 Review: While he'd been building a reputation for a few years already, it was 2009's In The End (I Want You To Cry) EP for Running Back that first thrust Marco 'Tensnake' Niemerski towards the spotlight. Some six years on, Gerd Janson has decided to put together an expansive new package of remixes. There's plenty to enjoy, from Pete Herbert and Dicky Trisco's breezy, guitar-laden boogie rework of "Holdin' Back (My Love") and Prins Thomas's dense-but-wonky, Scandolearic disco revision of the same cut, to the bright-and-breezy, rush-inducing melodiousness of Lone's sublime rework of "In The End (I Want You To Cry)". Tiger & Woods' remix of "Holding Back (My Love)" - all relentless build followed by thrilling boogie-meets-house release - is also pretty darn special.